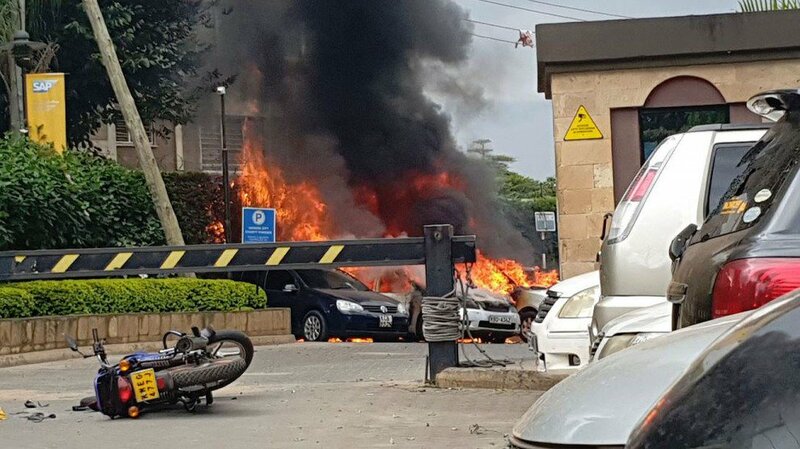 Police have arrested wife to Dusit D2 hotel suicide bomber Mahir Khalid Rizik, Sahaila Mwinyi in Barakani, Mombasa County. Rizik’s father has also been apprehended in Majengo area and has been taken in for questioning. CCTV footage showed the deceased blow himself up outside the Secret Garden before fellow terrorists started shooting indiscriminately. According to a witness Abdullahi Agello who saw him moments before the attack, he was on the phone with the other felled attackers. The 25 year old Al-shabaab operative is said to have grown up in Mombasa and was recruited at the Musa Mosque in Mombasa. Reports indicate that Rizik had been undergoing training in Somalia for the past year only to return to Kenya on January 13, 2019. It is then that he met with Ali Salim Gichunge at his Muchatha home, Kiambu County. Police are still looking for Gichunge’s widow, Violet Kemunto who took off after the 19 hour Tuesday attack. Kemunto has been described as a calm, friendly and kind person who studied journalism at Masinde Muliro University. She is believed to have been the mastermind of the brutal attack. Her friends say she disappeared without a trace in 2016 only to resurface in 2018 announcing her marriage to Gichunge. She has five siblings, some of whom reside in the US.